An Ilkeston thug who violently assaulted a man in a churchyard has been sentenced to 16 years in prison. He had previously pleaded guilty to causing grievous bodily harm with intent. The assault occurred in the early hours of Saturday, June 30 at St Mary’s Church, Market Place, Ilkeston. The victim, a 32-year-old man, was asleep on a wall in the church yard. Rhodes and his friends approached and spoke to him, waking him up. Following a brief verbal exchange, Rhodes punched the man’s face, causing him to fall unconscious before standing over him and unleashing further punches. 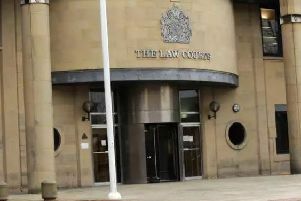 He was pulled back by friends, but then picked up a builder’s hard hat and used it to unleash further blows to the face of his victim, who suffered serious head and facial injuries. PSI Lindsey Scribbins said: “This sentence reflects the severity of the prolonged attack. The judge deemed Rhodes to be a dangerous offender and said this lengthy prison term will also go towards protecting the public from Rhodes and his violent behaviour. “The victim was a completely innocent member of the public, targeted by Rhodes for no reason and without provocation.